Ashington RAOB’s year of champions came to an end with a 5-2 home defeat against Blyth Town Sunday. Kyle Downey scored both goals for the Buffs with Josh Willis their star man. Paul Katz led the scoring for the Town with two and further goals came from Martyn Hepple, Jack Patterson and Darren Pendleton. Stand in keeper Daniel Wilson was their star player. 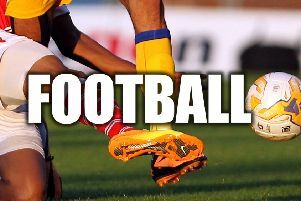 Ashington Town Central won at home in another seven goal thriller against Marden Residents. Star man Michael Todd led the scoring with two and there were also counters for Aaron Oaks and Kevin Chapman. Chris Ridgeway (2) and Joe Bell scored for the Residents and goalkeeper Ross Little was their star man. Ashington Station Lounge and Block and Tackle shared the points in a local derby with a 4-4 draw. Star man Damien Stevens led the scoring for the Lounge with a hat-trick and Alan Gibbard was also on target. Bradley Higgins (2), Ross Jeffrey and Callum Johnson scored for the Block and Tackle and Drew Tipple was their star man. On Sunday the final league games take place when the Division One title will be decided.